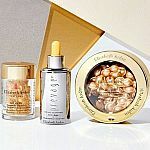 Estee Lauder has select items on sale. Choose one deluxe gift with every $25 purchase, up to 6-pieces gift. Shipping is free.